24 years after it was first recommended to me by my mate Kermit, I’ve finally read ‘Watchmen’, the 1987 graphic novel by the British pairing of writer Alan Moore and illustrator Dave Gibbons. I knew it was going to be something special, so, suffice to say, its right up there for me, a really substantial piece of work with its powerful cast of archetypal characters – take a bow Rorschach, Dr Manhattan, Ozymandias, Nite Owl II, Silk Spectre II, The Comedian, Silk Spectre, Nite Owl and all those in supporting roles who collectively served to knit together what’s been for me, in these past few weeks, an ever-unravelling gift that keeps on giving. A number of people told me I did things in the wrong order by watching the film before reading the book, but, as I explained elsewhere, I hadn’t read a ‘superhero comic’ since I was a kid and, furthermore, although I read a lot, only a small amount of this is fiction. Sometimes you have to wait until you’re in the right head space before you can take in the full weight of something new and unfamiliar, and, with regards to ‘Watchmen’, this turned out to be the right time for me. Had I not watched the film it’s unlikely that my interest in the book would have been suitably stirred, so although I came into this discovery upside down, it was the only way I could have approached it, at least in this place and time, so I say Viva Zack Snyder! What really hooked me in were the popular culture references that were so effectively combined in the title sequence of the film, which I embedded within the ‘All Along The Watchmen’ post – this illuminated a parallel universe where JFK shakes hands with Dr Manhattan and where The Comedian is spotted on the grassy knoll, where a TV channel tells us Nixon has been elected for a third term and where the troops fire their guns at the hippies when flowers are placed in the barrels, where Silhouette kisses a beautiful nurse on VJ Day and where Ozymandias strolls into Studio 54 three decades on. Given all my associated interests and obsessions, it’s no wonder that it reeled me in hook, line and sinker! 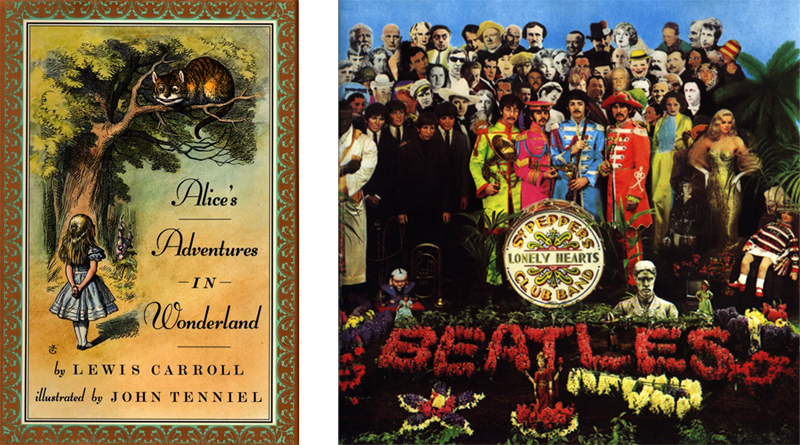 I appreciate that it’s a weighty comparison, but I can’t help but think of another book that’s vast in its scope, depth and layers, Lewis Carroll’s ‘Alice’s Adventures In Wonderland’, which is still a continual subject of fascination almost 150 years after it was written, finding particular favour in the ’60s when the LSD inspired cultural landscape opened up a whole host of new meaning in its pages, Alice becoming a muse for songs by The Beatles and The Jefferson Airplane, amongst others. On the surface both books can be described in the simplest terms, a children’s story / a superhero comic, and are never appreciated as anything other than that by many people, but if you’re able to read between the lines and into the corners, all those hidden riches begin to sparkle and you realise that you’re dealing with something altogether more profound, which will transcend it’s time to speak clearly to future generations. Just as ‘Alice’ will still be a source of wonder for those who read it 50 years from now, I’ll stick my neck out and say that so too will ‘Watchmen’. It’s all in there – politics, religion, science, philosophy, the nature of time, fate and destiny, so many big questions. It pokes around the hornet’s nest of human nature, placing the microscope on power and its evil twin, abuse of power, seeking to make us ask our own questions and form our own moral judgements, rather than preach answers at us. – taken not from the imagination of Alan Moore, but from the speech John F. Kennedy was to have given in Dallas on November 22nd 1963, the day he was assassinated. Brilliantly written, remarkably illustrated, totally innovative – it’s one superlative after another. Just as The Beatles elevated pop music, once regarded as frivolous by the establishment, to the status of ‘art form’ following the release of their era defining 1967 album ‘Sgt. Pepper’s Lonely Hearts Club Band’, 20 years later the ‘Watchmen’ graphic novel would gain acclaim not only in the comic book world, but the art world as well. Just as with ‘Alice’ and ‘Sgt. Pepper’, it had met its zeitgeist head on – it reflects its time, yet transcends time. 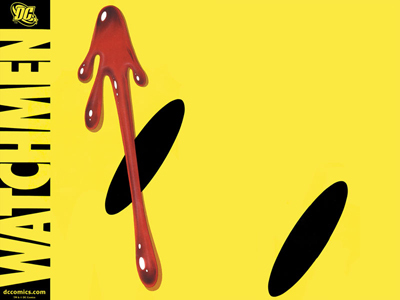 It should also be noted that the blood smeared smiley face that symbolized ‘Watchmen’ would subsequently inspire the symbolism of the Rave generation. ‘Watchmen’ had adapted the famous ’60s button (American word for badge) created in 1963 by Harvey Ball, but most people assumed that its Rave revival represented the linking of Acid-House’s ‘Second Summer Of Love’ in the late ’80s to the original Hippie ‘Summer Of Love’ in 1967. 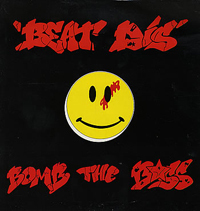 The true inspiration can be traced via the sleeve of the 1987 cut-up release ‘Beat Dis’ by Bomb The Bass, a key British dance single (eventually reaching #2 on the UK chart) that directly referenced ‘Watchmen’ on its cover just as the Acid-House movement was building a head of steam – it wasn’t by design, but a case of smiley faced serendipity. As soon as I finished the book I called Kermit – as fate would have it he was actually watching the film at that very moment! Apart from anything else I wanted to know what his thoughts were about the fact that the film altered the end of the book. I personally thought it was a really clever change, which didn’t take anything away from the overall story, but gave things a further twist, and I was glad to hear that he felt pretty much the same. 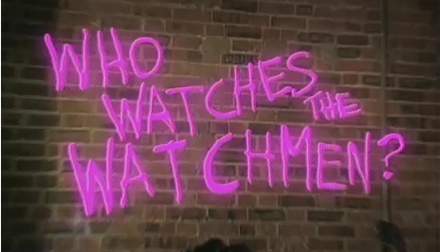 I knew that some ‘Watchmen’ fanatics were up in arms about this, so I wondered whether it was because I’d seen the film first that I felt this way. He was delighted that, almost a quarter of a century on from when he’d recommended the book to me, I’d finally read it, and that it had obviously made such a deep impression on me. He reminisced about how he’d bought the original comic series in ’86/’87, reading though the latest issue over and over, whilst eagerly awaiting the next instalment. Must have been quite a buzz! For further reading he recommended ‘The Invisibles’ and ‘The Sandman’, as well as some of Alan Moore’s other work, including ‘V For Vendetta’, ‘From Hell’ and ‘The Extraordinary League Of Gentlemen’. 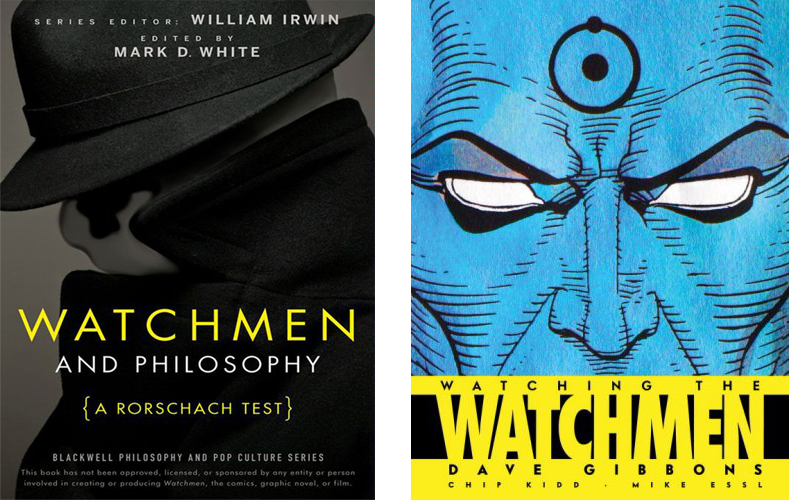 So, once I’ve got through the other ‘Watchmen’ related books I’ve purchased, ‘Watchmen And Philosophy (A Rorschach Test)’, edited by Mark D. White, and ‘Watching The Watchmen’ by the comics illustrator, Dave Gibbons, I’ll cast my comic book net further afield and continue this new found exploration. Don’t forget to add some Frank Miller works to your reading list. Miller is probably most famous for The Dark Knight Returns which like The Watchmen is one that everyone “should” read (http://en.wikipedia.org/wiki/The_Dark_Knight_Returns). A personal favourate of mine is the often overlooked “Ronin”, http://en.wikipedia.org/wiki/Ronin_(DC_Comics) it’s the equivalent of a silent movie with barely any text at all but probably manages to evoke more feeling because of it. I’d love to see what you feel about Manga too! It’s some comic book! If you are looking for others for when that frame of mind is kicking try two of my favourites: Elektra:Assasin (http://en.wikipedia.org/wiki/Elektra:_Assassin) and The Dark Knight Returns (http://en.wikipedia.org/wiki/The_Dark_Knight_Returns). Beautiful art; great twists on some popular characters. I’ve read V for Vendetta. It’s worthwhile but a bit like trudging through treacle in parts. The king of these graphic novels, so I’m told, is From Hell, which I am about a quarter of the way into. It’s very good so far. Lots of historical facts about the history of London buildings but it never feels forced. for a guy like you greg the graphic novel form is perfect “welcome to the fold”…. Intriguing stuff! I don’t read much, gonna give it a go….